Rice dishes are a meal by itself to many. This section comprises of high protein rice delicacies, most of which include a combination of a cereal with a pulse or a dal or addition of protein rich paneer to it. A horde of veggies have also been accommodated in these recipes to not miss out on important antioxidants which help our body form a strong immune system. Bajra Whole Moong and Green Pea Khichdi, Bulgur Wheat and Matki Pulao, Paneer Mutter Biryani, Masoor biryani are a few examples to support it. 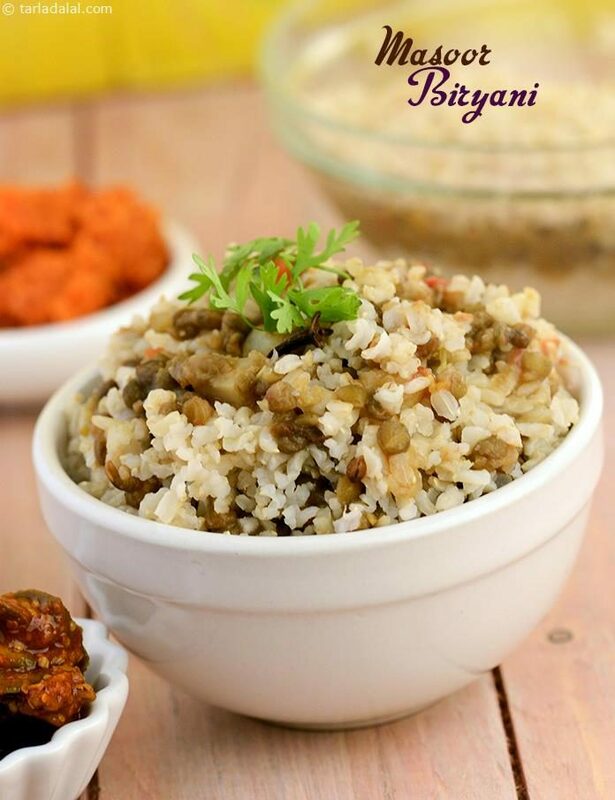 Of course, not to forget sprouts are also one of the good source of protein, we have included recipes like Spicy Sprouts Pulao, Buckwheat and Sprouts Khichdi and so on. Apart from being protein rich, most of the recipes in this section have been cooked with limited quantity of fat and the spice level has been adjusted accordingly to suit ones palate. A bowl of curd pairs well with most the recipes in this section. As the name suggests, this dish brims with Tarkari (vegetables) and the nutrients that they contain. To add to the goodness of vegetables, moong dal is also a rich source of protein, folic acid and zinc. An interesting combination of health and taste makes this dish a must-try! Pulaos are always a welcome addition to any meal. A pulao can often make a complete meal by itself. The soya chunks added to this aromatic pulao are easily available in the market and are a rich source of protein and vitamin b12 - a vitamin which is otherwise lacking in vegetarian diets.